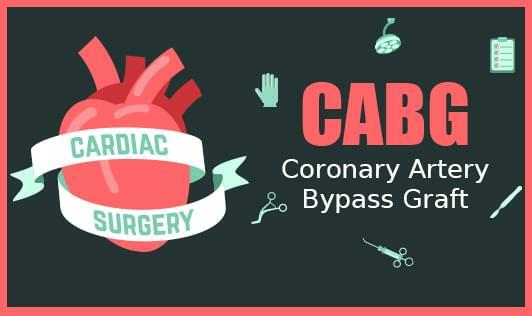 The coronary artery bypass graft is a surgical procedure which is used to treat coronary heart disease, it aims to improve blood flow to an obstructed coronary artery. It is indicated when the coronary artery has 50-90 % blockage. In CABG a healthy artery or vein from the patient’s body is connected to the blocked coronary artery, the connected artery or vein bypasses the blocked portion of heart vessels to get more oxygen- rich blood supply around the blockage of the heart muscle for proper functioning. Medicine prescribed by the doctor should be taken timely. Cleaning of chest incision and graft incision should be done regularly according to the instruction of the doctor. Don’t exert yourself too much, avoid to sit and stand for a long period. Avoid lifting heavy weight and activity involving too much use of shoulder joint for a few weeks. Don’t travel for at least 2-4 week. It should be very clear that CABG does not cure heart disease so it is important to adopt a healthy lifestyle to reduce the further complication of heart.